This brief review identifies seven key science questions in relation to climate variability and change and examines recent research within the Australian and Pacific context: 1. How do the key processes controlling climate variability and predictability operate? 2. What are the nature and causes of regional climate anomalies, past variations in regional climate and extreme weather events and how will they change in the future? 3. How can we provide improved seasonal-to-interannual climate predictions? 4. What are the best projection methods? 5. What are the sea-level changes now and in the future; and how will these impact the coasts? 6. How to have significant benefits on climate service delivery and environmental management? 7. What are the best methods for assessing climate change risks, vulnerability and adaptation options? Climate Variability and Change (CVC) refers both to an administrative entity, and to an area of science. As an administrative unit, until 30 June 2013 its 110 staff comprised one of the five research programs of the Centre for Australian Weather and Climate Research, which is a joint partnership between the Australian Bureau of Meteorology and CSIRO, which is the Australian Government Scientific Research Agency. The Bureau of Meteorology has 1490 ongoing and 284 non-ongoing staff. The CSIRO has 6500 staff, and the relevant Division of CSIRO namely Marine and Atmospheric Research (CMAR) has 550 staff. * Climate Change, which includes studies of processes; detection and attribution (which in this context means being able to separate out the influences of climate variability from the influences of climate change), projections of climate change into the future, sea level and coasts, as well as the effects of climate change through studies of impacts, adaptation and vulnerability. How do the key processes controlling climate variability and predictability operate? What are the nature and causes of regional climate anomalies, past variations in regional climate and extreme weather events and how will they change in the future? How can we provide improved seasonal-to-interannual climate predictions? What are the best projection methods? What are the sea-level changes now and in the future; and how will these impact the coasts? How to have significant benefits on climate service delivery and environmental management? What are the best methods for assessing climate change risks, vulnerability and adaptation options? This review utilises these questions as the basis for the sections that follow. Our ability to predict the impacts of climate variability and climate change, and to separate the roles that each play in present and future climate, can be increased through a better understanding of the processes that drive present-day climate. There are two distinct ways of conducting such research. One way is to examine details of the large-scale atmospheric processes that are known to influence climate such as the El Nino Southern Oscillation (ENSO), the Madden-Julian Oscillation (MJO), the Hadley circulation, and the baroclinic circulation of the mid-latitudes. These processes are often called the climate drivers, even though it is a semantic question as to whether they drive the climate or whether it is the climate that drives them. True climate drivers, such as greenhouse gas forcing, aerosols and, to some extent, ozone are those that arise from external forcing to the climate system. The interactions that determine the regional change in rainfall and how climate change may affect them in the future. Weather and climatic extremes, persistent and extensive anomalous circulations associated with long-lasting droughts and floods and their relationship to climate change. The roles of greenhouse gas forcing, aerosols, ozone and natural variability. CMIP5, the fifth climate model inter-comparison project, consists of stored results of climate change models output from over 20 modelling groups from around the worlda. Sea surface temperature (SST) in the Pacific Ocean is a dominant influence on the climate of both Oceania and Australia. To understand better the Pacific, and the small island developing countries situated there, the Australian Bureau of Meteorology and the CSIRO worked with 15 partner countries to help generate scientific insight into the state of climate change in the Pacific now and in the future, under the Pacific-Australia Climate Change Science Adaptation Planning program (PACCSAP) . Brown et al. examined the behaviour of the West Pacific Monsoon for the 2080–2099 period using the IPCC high emission scenario known as RCP8.5. They found that during December, January and February there are increases in rainfall across the Southern Hemispheric equatorial regions whereas during June, July and August there are rainfall increases across the Northern Hemispheric equatorial regions – in other words increased rainfall during the respective summer period. Brown et al. also examined the changes to summer rainfall variability for the West Pacific Monsoon by examining the distribution of the rainfall standard deviation during the summer rainfall season for the (1986–2005) period and the future (2080–2099, using RCP8.5 scenario) period. While the year-to-year rainfall variability does not change greatly, it does seem to change for tropical Australia, Solomon Islands and Palau such that the direction of change is similar for these three regions: the tail of the distribution expands (more variability), i.e. wetter summer rainfall years become even wetter and drier summer rainfall years become drier. There seems to be a particularly strong signal of this expansion for the Solomon Islands. Brown et al. examined the South Pacific Convergence Zone (SPCZ), which is a band of cloud and rainfall in the south-west Pacific. The observed SPCZ is shown in Figure 1. Most CMIP3 and CMIP5 models are able to simulate this rainfall band, but it tends, when averaged over all the model results, to be too zonal rather than diagonal as observed. When examining climate change simulations, the SPCZ (in DJF) does not change position, but the area and intensity increase. This is consistent with increased tropical moisture convergence in the warmer climate. The South Pacific Convergence Zone as observed (a), and as calculated by the multi-model mean of the outputs from CMIP3 (b) and CMIP5 (c). The difference between the earlier CMIP3 results and the later CMIP5 results is shown in (d). The Australian Climate Change Science Program (ACCSP)  encourages collaboration amongst scientists within Australia. In most cases the collaboration is facilitated through co-investment with regionally based, externally funded, projects such as SEACI  – the South Eastern Australian Climate Initiative that dealt with the climate, weather and hydrology of the Murray-Darling Basin . In Western Australia a similar research activity, known as the Indian Ocean Climate Initiative – IOCI  started in 1998 and continued through three stages until 2012. Because of the long-lasting Millennium Drought that lasted from 1995 to 2009, Australian research on climate processes concentrated on examining the mechanisms responsible for such rainfall declines. Beer  notes that there are numerous definitions of drought, none completely satisfactory. The reason is that the term drought is used with at least three different meanings. A meteorological drought (normally measured in terms of rainfall deciles) occurs when the rainfall, over a period of time, is substantially below normal levels. An agricultural drought (measured, for example, by the moisture deficit in the top 200 mm of soil) occurs when the soil moisture, over a period of time, is substantially below normal levels. A hydrological drought (measured, for example, by water availability) occurs when drinking water impoundments, over a period of time, are substantially below normal levels. Droughts in eastern Australia are associated with El Nino, with prolonged El Nino events leading to prolonged droughts. The two most extreme drought periods in Australia are the Federation drought  of 1896–1902, and the recent Millennium Drought . There is some controversy over the start and end dates of these droughts with some authors extending the Federation drought from 1895 to 1903 and some starting the Millennium drought as early as 1991 with others claiming a start date of 1997. In the case of the Millennium drought there is agreement that it ended with the two back-to-back La Nina years of 2010–2011 and 2011–2012 . During the 1970s and 1980s the work of oceanographers (e.g. ) was influential in establishing the El Nino as an oceanic phenomenon with profound, large-scale climatic consequences. Climatologists [14, 15] had found that the El Nino could be quantified using the Southern Oscillation Index, and that it had a profound effect on south-eastern Australian rainfall. Consequently the phenomenon is frequently referred to as ENSO, which stands for El-Nino Southern Oscillation. Basically when ENSO is in an El Nino phase the eastern equatorial Pacific is warmer than usual, pressures are higher across much of Australia, and rainfall is reduced across much of south-eastern Australia. When ENSO is in a La Nina phase the equatorial Pacific is colder than usual and rainfall is increased across much of south-eastern Australia. The sub-tropical ridge, STR, is the descending branch of the Hadley circulation. The location of the STR has long been known to affect climate. More recently it was found that sea surface temperature in the Indian Ocean, as measured by the Indian Ocean Dipole (IOD), and winds in the Southern Ocean, as measured by the Southern Annular Mode (SAM)  also play a role in determining the climate and rainfall of south-eastern Australia . The Indian Ocean Dipole (IOD) refers to an out of phase variation in sea-surface temperatures between the western and eastern tropical Indian Ocean. It is quantified using the Dipole Mode Index (DMI) that is based on the measured difference between sea-surface temperature in the western (50° E to 70° E and 10° S to 10° N) and eastern (90° E to 110° E and 10° S to 0° S) equatorial Indian Ocean. The IOD typically develops in early winter, peaks in October - November and disappears by January. A negative IOD is associated with wetter conditions across south-eastern Australia, while a positive IOD is associated with drier conditions. The IOD is the most dominant large-scale influence on climate in south-eastern Australia in winter and spring, when it explains up to 40 percent of the rainfall variance in parts of south-eastern Australia. Feng et al. provide an alternate explanation for the decline in early winter rainfall over the southwest Western Australia. They note that the climate of southwest Australia exhibits a monsoon-like atmospheric circulation that is coupled to the rainfall in southwest Western Australia, but seems to be largely independent of the large-scale atmospheric circulation processes. Because the dominant effect of prolonged drought is the reduction of water supplies (i.e. hydrological drought), the management of drought in Australia is primarily a role for water authorities, which are entities that are controlled by State governments, rather than the Federal Government. In this respect the Western Australian water authorities have accepted that even though Western Australia has not had the high-profile droughts of eastern Australia, there has been a steady decline in rainfall and available water resources  over the past 40 years. A key question is whether changes, such as the decline in Western Australian rainfall, are due to global warming and climate change, or whether they arise from natural variability. Zidikheri and Frederiksen  developed a nonlinear inverse methodology that has been developed and applied to the problem of determining the forcing functions responsible for climate change. The method was applied to the change in the temperature structure of the atmosphere between the 20 year periods 1949–68 and 1975–94. The external forcing function is largely zonally symmetric, consistent with large scale processes such as forcing due to increasing greenhouse gases although aerosols may also play a role in the local structures. The better climate models forced by increasing greenhouse gases reproduce similar changes in the flow and temperature structure during the 20th century and in projections into the 21st century. Rotstayn et al. show that anthropogenic aerosols may have “masked” greenhouse gas-induced changes in rainfall over the northern part of Western Australia and in the circulation over the wider Indo-Pacific region. Due to the opposing effects of greenhouse gases and anthropogenic aerosols, future trends may be very different from trends observed over the last few decades. Arblaster et al. find a similar result of opposing effects of greenhouse gases and ozone. Such studies, which involve “single-forcing” simulations of, for example, greenhouse gases, ozone or aerosols are a tool that can be used for attribution of observed changes, and reconciling the differences between recent and projected changes. Climatologists have long known that the Hadley circulation, which consists of warm air rising in the tropical regions and descending in the mid-latitudes plays a dominant role in global climate because the world’s major deserts all lie in the descending region of the Hadley circulation. The circulation can be quantified by measuring the location and strength of the sub-tropical ridge (STR). Pittock  confirmed its importance for Australian climate and it is important in understanding the decline in south-eastern Australian rainfall. The location of the STR is a measure of the width of the Hadley circulation. Lucas et al. show that the STR has been moving southward at a rate of 0.41 degrees per decade. This southward trend is correlated with global surface temperature and in addition, during major droughts the STR also intensifies  as shown in Figure 2. 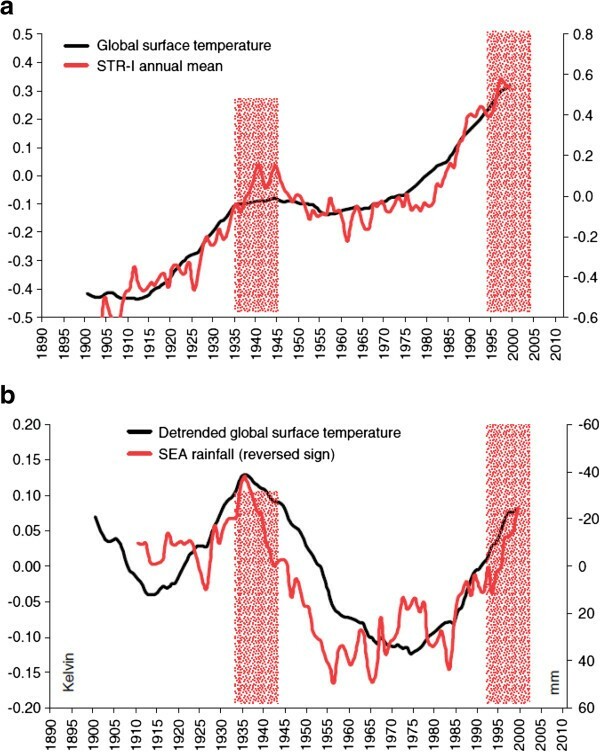 Twenty-one-year running means of global temperature (black line) and the STR intensity (red line). Both curves show anomalies relative to the 1961–1990 WMO reference period. (a) For global temperature, the y-axis is on the left, and for the intensity (in hPa) the y-axis is on the right. The dry decades (1935–1945 and 1997–2009) are indicated as pink bars. Similar curves are given in (b) for the detrended (using a linear trend computed from 1900 to 2009) global warming (black line) and the reversed sign of south-eastern Australian rainfall (red line). The decline in rainfall in south-west Australia in the 1960s was due to fewer days with low pressure weather systems . The rainfall decline since the late 1990s has been due to the persistence of high pressure systems, which are projected to continue . Frederiksen et al. examined the trends in Baroclinic Instability (BI) using the Phillips Criterion. These show negative trends in regions where mid-latitude storms would normally form – this implies reduced likelihood of storm formation in these regions. Positive trends occur further south associated with increased likelihood of storm formation. More recent analysis indicates that CMIP5 models tend to show maximum trends that are about half the observed. These trends are consistent with the STR movement, are statistically highly significant, and the results indicate that they are likely to continue into the 21st century. Multi-week and seasonal predictions fill the gap between shorter term “weather forecast” and “climate scale” projections. These predictions support preparedness, planning and decision making in a range of sectors such as water resource management, agriculture, emergency management, mining, natural resource management, finance, defence and tourism. The science of prediction in this domain has matured significantly with better understanding and monitoring of key influences such as ENSO, IOD and SAM along with the development of dynamical predictions systems that provide reliable and useful probabilistic regional climate predictions on these time scales. 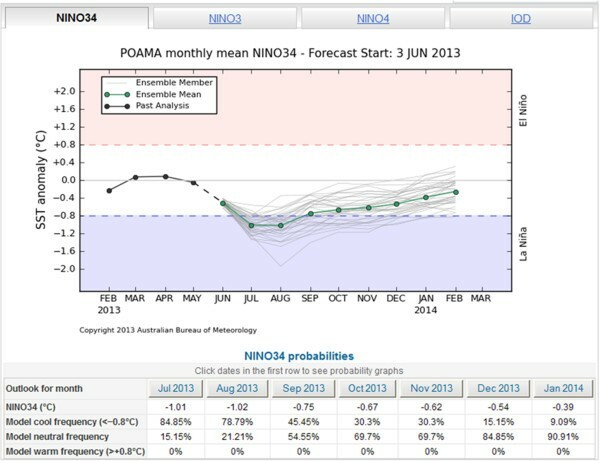 The dynamical seasonal prediction system, POAMA, is now running within the Australian Bureau of Meteorology and provides seasonal outlook products to the community . POAMA outlooks are displayed from the 1st of each month and give forecasts out to nine months ahead. The model ensemble distributions shown in Figure 3, taken from the relevant web site  provide a range of possible developments in sea surface temperature in the equatorial Pacific Ocean for the NINO34 region. As may be seen from the tabs at the top of Figure 3, model results are available for other Nino regions and also for the Indian Ocean through forecasts of the Indian Ocean Dipole (IOD). Monthly mean forecasts generated on 3 June 2013 for the sea surface temperature anomaly in the NINO34 region of the Pacific Ocean (5°N - 5°S and 170° - 120°W). Prediction at longer time scales is hampered by the episodic nature of volcanic eruptions which, though relatively rare, have a significant impact on climate. Nevertheless, because anthropogenic forcing from greenhouse gases and aerosols are now believed to be strong drivers of future climate it has become possible to produce models of future climate. There are numerous modelling groups around the world that produce such models, and these have been collated into the CMIP5 data set mentioned earlier so that estimates of future climate, and the uncertainties of the estimates, can be obtained by analysing the ensemble of CMIP5 model runs. Kirtman et al. summarise the four major areas of research that are needed to realise fully the potential for seasonal to inter-annual climate prediction. These are: 1) Improve the fidelity of the climate models at the heart of the forecast systems; 2) develop better measures to define and verify forecast reliability and skill; 3) design improved ensemble prediction systems; and 4) refine product outputs to have greater utility for decision-making. On seasonal to inter-annual time scales the upper ocean heat content is a known source of predictability that has been incorporated into statistical methods of seasonal forecasting . The corollary of this is that we require improved forecasts of upper ocean heat content to be able to provide improved seasonal to inter-annual predictions. We will examine this issue in Section 5. Climate projection science needs to serve the rapidly growing needs of impact and adaptation assessments (generally called risk assessments) despite substantial differences in the regional projections of climate models, and an expanding number of potentially relevant climate model results. The choice to be made when designing methods for climate projections is whether to use the full set of available climate models, such as those in the CMIP5 data archive; whether to use a subset of these models based on pre-determined criterion of reliability and skill; or whether to seek the single model that appears to be most reliable and skilful for the task at hand and use it to generate ensembles of future climate. Whetton et al. eschewed selection of a small number of climate models based on their ability to replicate current climate and instead classified the range of plausible future climates as simulated by climate models into a small set of Representative Climate Futures (RCFs) along with an estimate of the relative likelihood. Consistently applied within a region, RCFs, rather than individual climate models, can become the boundary objects that anchor discussion between the climate science and risk assessment communities, simplifying communication. Watterson  developed a method to extend the results of single variable probability distribution functions (PDF) to provide relatively smooth joint PDFs for impact assessments. A basic use, developed by Watterson and Whetton , is to estimate an impact for each grid point across the domain, and assign this a probability determined from the joint PDF. Furthermore, the probabilities of subdomains of change can be determined from the joint PDF and can be used in the RCF approach. Abbs  and Lavender and Abbs  used a subset of climate models to examine the impact of climate change on tropical cyclones in the Australian region. They note that there are approximately 12 per year of which 40% (~5) make landfall over the Australian continent and in doing so provide a large proportion of rainfall in tropical Australia, but cause widespread damage. Climate change projections show a strong tendency for a 50% decrease in tropical cycle numbers in the region of current preferred occurrence, a small decrease (0.3 days) in the duration of a given tropical cyclone and a southward movement of 100 km in the genesis and decay regions. There is a shift towards deeper pressures, an increase in precipitation, an increase in size and a flattening of the maximum wind speed distribution such that a larger percentage of tropical cyclones are expected to produce high winds in 2070 than in 2030, or than in 1980. Both the density and the specific heat capacity of seawater are non-linearly dependent on the temperature and the salinity of the seawater as quantified by the equation of state for seawater TEOS-10 . Because the heat flux from the atmosphere to the ocean, or to the atmosphere from the ocean, depends on the density and specific heat capacity of seawater it is crucial that the salinity of seawater, as well as its temperature, be exactly determined in a coupled ocean–atmosphere model. As indicated above, seasonal to inter-annual predictability is dependent on accurate prediction of the upper ocean heat content. Church et al. 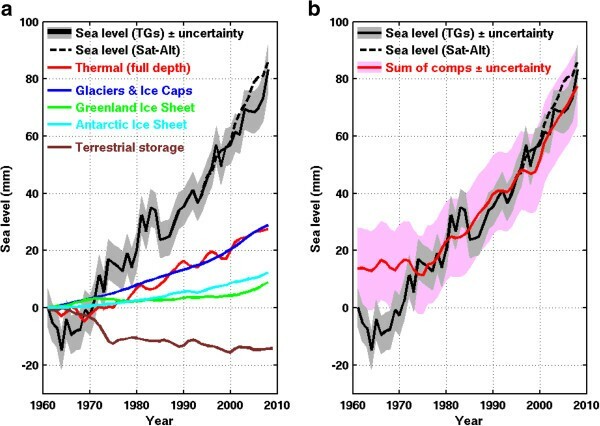 have identified the acceleration of sea level rise and determined the relative contribution of the various elements such as thermal expansion, glaciers and ice caps, the ice sheets of Greenland and Antarctica as well as terrestrial water storage (Figure 4). Glaciers and thermal storage are the largest contribution. Gregory et al. have made progress in closing the budget for the 20th century to reduce the uncertainty and provide improved estimates of the terrestrial storage. The global sea–level budget from 1961 to 2008. (a) The observed sea level using coastal and island tide gauges (solid black line with grey shading indicating the estimated uncertainty) and using TOPEX/Poseidon/Jason–1&2 satellite altimeter data (dashed black line). The two estimates have been matched at the start of the altimeter record in 1993. Also shown are the components of the sea level. (b) The observed sea level and the sum of components. The estimated uncertainties are indicated by the shading. The two time series are plotted such that they have the same average over 1972 to 2008. Church and Roemmich  list six recommendations for further observational activities and numerical model studies that include: 1) expand the historical database; 2) sustain and extend the program of oceanic floats (Argo floats); 3) observe in the deep-ocean (below Argo float depth) and in the coastal region (too shallow for Argo floats); 4) maintain and use satellite altimeters; 5) use modern data assimilation techniques; 6) improve detection and attribution of past steric sea level rise; 7) reduce uncertainty in the projections of future steric sea level rise; and 8) produce better projections of sea level change in the continental shelves and coasts through high resolution investigations. Though, in the long term, sea level rise will impact coastal communities, in the short term storm surge and wave effects have a more visible and dramatic impact with the most extreme example being the tsunami that occurred in Japan following the 11 March 2011 magnitude 9 earthquake where the damage by surging waters proved to be more deadly and destructive than the earthquake itself. Lowe et al. note that the rate and unpredictable nature of tsunamis means that they are probably under-estimated in probabilistic estimates of future extreme sea-level. In practice atmospheric drivers of extreme sea level such as mid-latitude and tropical storms are more amenable to analysis and prediction. Lowe et al. illustrate this with case studies of the Bay of Bengal and of Australia and note that future research needs to: 1) extend the evidence basis for change; 2) increase the mechanistic understanding of the drivers of change; and 3) improve predictions. Scientists traditionally disseminate their results though publications in learned scientific journals with the expectation that the information will diffuse to the wider community through a process whereby the knowledge is synthesised in review papers, then monographs and textbooks until it becomes part of the general knowledge of scientifically literature people. With the recent high public profile of climate change both government decision-makers and the public want to obtain the information rapidly, and in a more readily assimilable manner than that provided by scientific papers. At the international level the provision of authoritative information about climate change science is the province of the Intergovernmental Panel on Climate Change, generally known by its acronym, the IPCC whereas research on climate itself is the province of the World Climate Research Program, WCRP . The appropriate framework for the provision of climate data and services has recently been a concern of the World Meteorological Organisation (WMO) exemplified by the release of the Global Framework for Climate Services . Figure 5 depicts the five components of the framework. 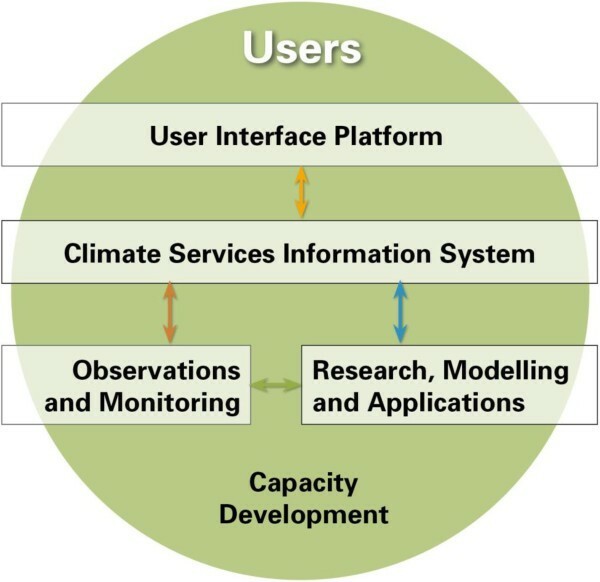 A conceptual illustration of the five major pillars of the global framework for climate services (GFCS) that stresses that the pillars need to co-ordinate and integrate. Within Australia, both CSIRO and the Bureau of Meteorology, in conjunction with various government departments, have experimented with web-based delivery of climate tools. One of these, OzClim  enables users to generate climate change scenarios for Australia and thus explore scenarios from 2020 to 2100. Another very popular way of making the Australian public aware of climate drivers was through the use of the climate dogs cartoons . The idea behind representing major climate phenomena such as ENSO, The Indian Ocean Dipole (Indy), The Sub Tropical Ridge (Ridgy) and the Southern Annular Mode (SAM) as sheep dogs is that the Australian agricultural community is familiar with the concept of sheep dogs herding white fluffy things like sheep, so that they would easily understand the idea of climate drivers herding white fluffy things like clouds. The idea has been extended to the Pacific Islands with the introduction of the animated video adventures of the climate crab . The Australian public have also taken a direct and active part in the Climatewatch  program whereby the public is invited to observe their favourite wildlife or plane and record changes that they observe. Climate change poses risks to many aspects of human society. As a result, the understanding of future climate, and the generation of climate scenarios is only the first step in determining who and what is vulnerable to climate change, the risks that these vulnerable entities face, and their options to adapt to climate change. Coastal erosion is a problem that is of particular concern to Australian local government authorities,  who have responsibility for the protection of beaches, foreshores and sensitive environmental habitats such as mangroves. Whether to describe waterfront areas with mangroves as mangrove forests, with a strong implication of the need for forest conservation, or as mangrove swamps, with a strong implication of the need to eradicate and clean up such areas, can influence public opinion. Thus the use of language is also an important component of climate service delivery and the assessment of climate change risks. Coastal erosion and sea level rise are even more important issues for Pacific Island States . The vulnerability of 14 Pacific Island and East Timor have been assessed and their climate change risks have been evaluated in country specific reports that formed part of the Pacific Climate Change Science Program . The adaptation options need to be determined by the individual Island States. Within Australia studies have examined burrowing nesting seabirds and air temperature. Heat events are the climatic threat in this case. The study  examined the following adaptation options: (1) Reduce exposure by shading natural and artificial burrows with either, or a combination of, a) natural vegetation b) soil/insulation c) shade cloth; (2) Raised boardwalks to provide shade and protection from weather and tourists. These examples illustrate some of the issues being confronted in the assessment of climate change risks, vulnerability and adaptation options. An important research question in assessing climate change risks is to what extent these risks arise from extreme conditions. This question has already been considered in the context of sea level rise. Coastal erosion, for example, is a phenomenon that illustrates punctuated equilibrium. The coastline in general is stable until a severe storm, or extreme wave, erodes it, after which it remains stable until the next severe storm or wave. But there are occurrences when extreme weather events and extreme impacts are not related such as when a mild storm leads to floods that affect critical infrastructure ; or when a tropical cyclone makes landfall in a desolate location. The number of disasters of hydrometeorological origin recorded in the EMDAT database  grew exponentially between 1950 and 2000. The extent to which this growth can be attributed to climate change, to a greater spatial distribution of the population, or to improved detection and reporting protocols is unclear and forms a continuing debate within the hazards and disaster research community . Research on climate variability and change seeks to use science to deduce climate risk, and to undertake research to foster sustainability. The science that is needed to deduce climate risk involves determining methods of seamless prediction, whereby weather prediction models, seasonal prediction models, decadal prediction models and climate models can all be used to determine future risk. Achieving this will require an increased understanding of climate processes, and also will require methods to reduce uncertainty in climate science and climate models. This uncertainty is particularly manifested in examination of climate change effects on extreme events which are important not only because they impact on life and property, but because the changes to the natural environment – such as beach erosion – occur as a result of high waves during extreme events. The research that is needed to foster sustainability, including the determination of adaptation options, revolves around methods to meet the public interest in climate change science. The scientific involvement is with improved methods of climate projections service delivery, the undertaking and production of integrated assessments that extend the climate research into the agricultural, economic, human welfare domains. Climate science is at the forefront of multi-disciplinary, inter-disciplinary and trans-disciplinary science. Climate science has been characterised as one of thinking globally but acting locally. Because the atmosphere forms part of the global commons, various international bodies have developed initiatives to study climate and its effects, generally referred to as global change. The International Council of Science (ICSU) has developed Future Earth  as a new 10-year international research initiative that will develop the knowledge for responding effectively to the risks and opportunities of global environmental change and for supporting transformation towards global sustainability in the coming decades. The International Union of Geodesy and Geophysics (IUGG) recently formed a new commission, the Commission on Climate and Environmental Change (CCEC), to provide support to the Future Earth initiative. CCEC was instrumental in persuading a consortium of international scientific unions to undertake an initiative on weather, climate and food security (WeatCliFS). WeatCliFS intends to catalyse an integration of activity of many existing programs on hydrometeology, on natural hazards and extreme events, on agriculture and food security and on disaster risk reduction. a The CMIP5 data, as well as information about the project, can be obtained from: http://cmip-pcmdi.llnl.gov/cmip5/.